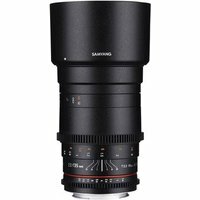 The Samyang 135mm T2.2 is a manual focus lens that allows for delicate, artistic video work on Sony's full-frame E-mount cameras, such as the a7 models. The focus gear ring is installed for follow focus system. You may change the aperture quietly and smoothly with the uncoupled aperture gear rings. Also, distance scale and T numbers are marked on both sides of the lens for convenience. This telephoto prime expresses vibrant colour and soft out-focusing area which makes it the best lens to shoot portrait, night scenery, wild-life and journalism photography.